Cambridge, Mass. – The U.S. District Court in the Southern District of Florida ruled yesterday that the claims for crimes against humanity and extrajudicial killings could move forward in two related U.S. cases against former Bolivian President Gonzalo Daniel Sánchez de Lozada Sánchez Bustamante (Sánchez de Lozada) and former Bolivian Defense Minister Jose Carlos Sánchez Berzaín (Sánchez Berzaín). The cases, Mamani, et al. v. Sánchez Berzaín, and Mamani, et al. v. Sánchez de Lozada, seek compensatory and punitive damages under the Alien Tort Statute (ATS). Judge Adalberto Jordan ruled that Bolivian plaintiffs have viable claims against Sánchez de Lozada and Sánchez Berzaín. Each of these plaintiffs has brought claims on behalf of a deceased relative who was targeted by forces under the defendants’ command. Among these plaintiffs are Eloy Rojas Mamani and Etelvina Ramos Mamani, whose eight-year-old daughter was killed in her mother’s bedroom when a single shot was fired through the window; Felicidad Rosa Huanca Quispe, whose 69-year-old father was shot and killed along a roadside; and Gonzalo Mamani Aguilar, whose father was shot and killed steps away from where he was farming potatoes. 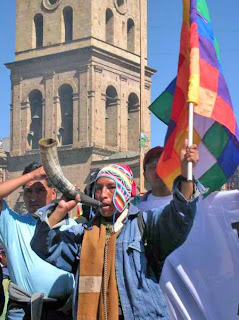 The complaints allege that in September and October 2003, Sánchez de Lozada and Sánchez Berzaín ordered Bolivian security forces to use deadly force, including high-powered rifles and machine guns, to suppress popular protests against government policies by targeting unarmed civilians in the indigenous Aymara community. “Six years after directing security forces to target Bolivian civilians, Sánchez de Lozada and Sánchez Berzaín move one step closer to having to answer for their actions in a court of law,” said Jeremy Bollinger, an attorney with Akin Gump Strauss Hauer & Feld. On October 17, 2003, both Sánchez de Lozada and Sánchez Berzaín fled to the United States. The complaints were filed in September 2007. Yesterday’s decision grants in part and denies in part the defendants motion to dismiss. The legal team includes CCR cooperating attorneys Judith Chomsky, Beth Stephens and David Rudovsky; Steven Schulman, Jeremy Bollinger, Mike Small, and Chris Petersen from the law firm of Akin Gump Strauss Hauer & Feld LLP; James Cavallaro, Tyler Giannini, and Susan Farbstein from the International Human Rights Clinic at Harvard Law School; Jennie Green of the International Human Rights Clinic at the University of Minnesota Law School; Paul Hoffman of Schonbrun, DeSimone, Seplow, Harris and Hoffman; and Miami attorney Ira Kurzban of the law firm Kurzban Kurzban Weinger and Tetzeli. Republished from ¡Juicio a Goni Ya!